Sunyani, March 23, GNA - Mr Michael Kofi Asamoah, a former postal agent at Aboabo No.4 in the Dormaa District of Brong Ahafo on Tuesday told the National Reconciliation Commission that he lost his left eye as a result of a brutal assault on him by a militiaman in 1986. He told the first sitting of the Commission in Brong Ahafo that he was whipped so severely by the militiaman, whose name he could not remember, in the full glare of his wife and children and others in the main street of the town, as he was ordered to lie prostrate. 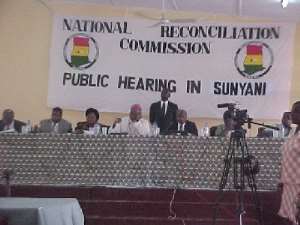 Some 61 witnesses will testify during the Sunyani hearing, scheduled to last for five days. Mr Asamoah, the second to testify for the day, told the Commission that he was currently unemployed and was in poor health because of the beatings he received at the hands of the militiaman and some soldiers at the Sunyani Liberation barracks where he was later kept for three days without food nor water. Witness said he was relaxing in front of the post office at Aboabo No.4 at about 0900 hours on Monday, March three, 1986 when a Nissan Patrol vehicle pulled up near him with one of the occupants pointing at him. He said a young man, who was in mufti and who he later learnt was a policeman got down from the vehicle and asked him if he knew one Mr P.C. Manu to which he replied in the affirmative. Witness said the policeman asked of Mr Manu's whereabouts but he said he had not seen him for about three months. The policeman asked him to follow him to the vehicle and when he asked for the reason, the former pulled out a pistol. "So out of fright, I meekly followed him to the car," Witness said. Mr Asamoah said there were two soldiers and two policemen in addition to the militiaman in the vehicle. He recalled the name of one of the soldiers as Sergeant Adams and one of the policemen as Sergeant Akamenko. He said he was taken to another village in the district where two teachers - Mr Emmanuel Asamoah Antwi and Bernard Fordjour - were also picked and they were together brought back to Aboabo No.4. Witness said when they got to the town he was taken to the post office under the pretext that he was to be searched but Sergeant Akamenko picked a coffee table and hit his head with it, sending him to the ground unconscious. He said although he did not sustain any injuries, he has developed a chronic headache as a result of that knock on the head. Mr Asamoah said while lying down one of the soldiers stamped his chest with his boot, adding that the beatings lasted for about 45 minutes and resulted in an injury to his left eye. Witness said he and the teachers were later sent to the Liberation barracks where they were detained in the guardroom for three days. He said all along they had not been told what crime they had committed. Witness told the Commission that on the intervention of the Bureau of National Investigations, he and the teachers were taken into police cells at the Sunyani District Police Station where they were kept for a further 20 days, but were not maltreated there. He said they were taken to the headquarters of the BNI in Accra where they were detained for 50 more days. "Up till this time nobody had told us why we were arrested and no charges had been preferred against us." Mr Asamoah said after the 50th day at the BNI headquarters, they were brought back to Sunyani and again detained for a week after which they were put before the public tribunal. He said it was at the tribunal that it was revealed to them that they had connived with Mr Manu to incite the people against that government. Witness said the case was adjourned 25 times and they were allowed legal representation and granted bail but the tribunal could not give its judgment. "Mr Otu Essel, chairman of the tribunal, told us on the 25th occasion to go home and would be recalled if we were needed again," he said. "So for 18 years now I have been on bail and during my incarceration the only statement taken from me was at the BNI headquarters," witness said in answer to a question from a member of the Commission, Professor Henrietta Mensa Bonsu. Mr Asamoah said after his release he found that his wife fled the town after his arrest and that his yam farm, worth about 10 million cedis at the time was also vandalised by unknown people. He said he has become a poor man, as he had had to sell all his belongings, including a building he was putting up, a bicycle and a tape recorder to defray part of debts he incurred through borrowing to cater for the farm. "I am still saddled with some debts and apart from my chronic headache, my children's education has been jeopardized," witness added. Mr Asamoah said although he was not dismissed from his employment, he could not continue because of his poor health. Commissioner Bishop Palmer-Buckle expressed concern about what happened to the Witness, saying the brutal assault on him by soldiers, policemen and civilians before his wife, children and residents of the town was a grave humiliation that depicted that "we all went mad at that time". "It is incomprehensible that such a hardworking and dignified man should be subjected to such humiliation - the rule of law should apply even if someone commits an offence," Bishop Palmer-Buckle added. Another witness, Mr Simon Ohene-Peprah, 64, a beer bar owner told the Commission that just after the June Four uprising in 1979, soldiers arrested and detained him in the military guardroom at the Liberation barracks "because some people were envious of me". He said he had just returned from the US and was operating about four fancy stores in Sunyani, each of them with the inscription "BOOZEN" on the door. Witness said a day after his arrest he was taken to the parade grounds where he was ordered to roll on the freshly gravelled grounds amidst whipping by the soldiers. Mr Ohene-Peprah said they were shaved at the barracks so even after his release, he remained indoors because of the shame that he faced as a swash-buckling young man who had just returned from the US. Witness said a few days after his release, a soldier called Osei came to his house and told him hat it was out of envy that he was picked up. Mr Ohene-Peprah said soldiers auctioned his goods at give-away prices without giving him the proceeds from the sale. He could also not estimate the value of the goods. "I later decided to deal in akpeteshie as I had become poor and my children's education was also in jeopardy," witness said. Witness prayed the Commission to assist him to enrol his children, whose education was disrupted because of his ordeal, in a skilled training.